New Virtual Console games. Pass them on. - GameSpotting! Nintendo has updated the Virtual Console list with two new games, Yoshi’s Cookie and Bases Loaded. This might be one of the most personal Virtual Console announcements thus far. 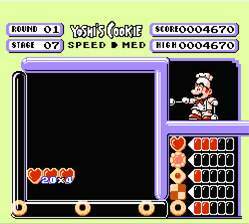 Having played Yoshi’s Cookie before, I can tell you it is one of the most boring games I’ve ever played. Despite it’s title (the reason I bought the game way back when), it’s not an adventure game, instead, it’s a puzzle game that’s kinda like a messed up form of Tetris. And don’t let the fact it has an “adventure” mode fool you. It’s really just a survival mode of how long can you last before blocks fill the screen. This game isn’t worth 500 Wii Points. And Yoshi isn’t really in this game (except if you play with another person). This game is not what you think it is. Don’t waste your points. You’ve been warned. Bases Loaded, I’ve never played (or heard of), but from the looks of it, I wouldn’t recommend this title either. It was great for its time, when graphics were…a big glob large colored squares, but now it seems like a waste. These two titles are both worth 500 Wii Points each. Personally, I’m passing, and I would advise you to do so as well. Yoshi’s Cookie (NES, 1-2 players, Rated E for Everyone, 500 Wii Points): Take one part puzzle game, combine with intuitive game play, add a pinch of multiplayer action and top with a layer of everyone’s favorite dinosaur. Mix together and let set for roughly 100 stages’ worth of time. If that sounds like a winning recipe to you, then step into the kitchen and get ready for a batch of fast-paced puzzle action. Hunker down to move rows and columns of randomly placed cookies in an effort to align all the cookies of the same type. Successfully assemble a row or column to make the line disappear, then move to a new one. If you’re good enough, you may even be able to make a Yoshi cookie appear! Feel like taking on a friend? Fire up the two-player mode, where you can attack your opponent while competing to match as many cookies as possible. Be careful, thoughâ€”if your timing is off, you could end up attacking yourself. Who knew dinosaurs had such a weakness for puzzle games and sweets? Bases Loaded (NES, 1-2 players, Rated E for Everyone, 500 Wii Points): Bases Loaded is a baseball game with an arcade feel and plenty of options from which players can choose. Select one of 12 teams, set your lineup from the 30 players available (each with different strengths), then play a single game or try to win the pennant. During game play, the screen shows two different viewpoints: one from behind home plate as you’re batting, and the other from the pitching balls in a television-style shot (unique for its time [seriously]) as your team plays in the field. Strong play control and excellent graphics add to the excitement as you decide what pitch to throw (you can even try to provoke the opposing batter into charging the mound), control all positions on the field, or do your best to get a hit. 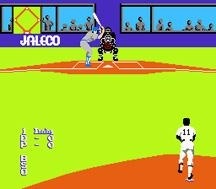 So step to the plate and find out why this is one of the most popular baseball games on the NES. Can you pull through in the clutch?